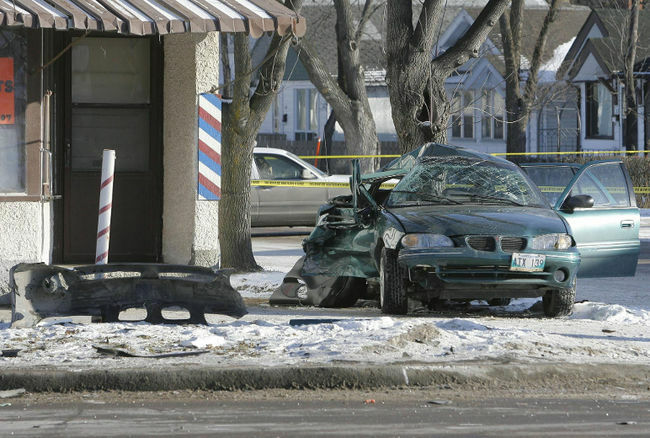 The full facts of John Casanova’s acquittal for dangerous driving in the fatality of Violet Gooding, 90, on Dec. 3, 2008 can be found here. I won’t repeat them. But it’s important to point out Judge Marvin Garfinkel’s ruling today followed from a consideration of a large number of applicable cases presented by the Crown and defence that dealt with dangerous driving, “the standard of care” and the continuum of negligence with respect to dangerous drive offences. In other words, Garfinkel surveyed and interpreted the law of the land in Canada as presented to him and arrived at the following (you’ll get the import of the law and his analysis in what’s presented below). “It is with the principles of these cases that the facts in this case involving Mr. Casanova must be considered and assessed. Consequences of the collision in this case were tragic. Violet Gooding died. There is nothing that this court can do that can repair that harm. However, the principles of previous cases show that the consequences are not a determinative factor. The manner of driving in this context must be assessed. The cases, the principles cited show that there is a continuum of negligence. A departure from a standard of care expected of a prudent driver may give rise to civil liability. For a criminal sanction to be imposed, it must be proven there was a marked departure from the standard of care of a prudent driver. The lack of proper care must be sufficiently serious to merit criminal punishment. Mr. Casanova was operating his motor vehicle on St. Mary’s Road between 10 and 10:30 a.m. The vehicle was equipped with studded tires, but it can’t be said with certaintly what effect that had on the collision. The road was clear, the sun was shining. There was no obstruction to vision. Mr. Casanova was speeding. His speed was excessive. He left the red light quickly and moved into the left lane. It would appear that vehicles speeding on St. Mary’s Road in this area were not unusual. However, Mr. Casanova’s speed was excessive. Violet Gooding had vision problems. What effect that had on the circumstances cannot be stated. It is not known. Moreover, there is no contributory negligence factor in a criminal prosecution. It is not known when Mr. Casanova saw the turning vehicle. Infrences from testimony of the witnesses can be drawn that Mr. Casanova did not try to brake soon enough, or that he was traveling too fast to stop safely. That leads to the conclusion that there was a departure from a standard of care that would justify civil liability. However, the manner of driving did not amount to a marked departure of a standard of care warranting of criminal sanction. The lack of prudence by speeding is a manner of driving that even the most careful driver may occasionally perform. I am unconvinced that Mr. Casanova’s manner of driving constituted a marked departure from the standard of care of a reasonably prudent driver in similar circumstances. I feel a Crown appeal coming on, but that’s just a hunch. What’s a bet if there is, a ground will involve the line bolded above. Do speed limits matter in law? Stay tuned. For the record: Saul Simmonds was Casanova’s lawyer. John Barr acted on behalf of Manitoba Prosecution Service. If there is an appeal James, I’d suspect that the problem will not be with what you’ve highlighted, but that Garfinkel failed to consider ‘excessive speeding’ a manner of driving that is a marked departure. People speed. It’s not imprudent at times to speed. That is why speeding is a regulatory offence for which you get fined- not one for which you get jail. In the last year, I’ve driven about 45000 km (yup, new job has me travelling via vehicle a lot); between 75-80000km in the last two years. Everyone here knows I speed (what most would call excessive) and I drive aggressively. No accidents during those two years. So while some people say they’ve never gotten a speeding ticket, and they’ve never been in an accident, I always wonder how much they drive. One can drive 20km over the limit and still drive cautiously, compared to someone driving the speed limit, but not paying attention. And, don’t forget the crown has to prove beyond a reasonable doubt that the speeding was a marked departure from the standard of care of a reasonable person. We assume most people are reasonable. So if most people tend to speed in that area, while not saying it is acceptable, I can see how it was possible that Garfinkel wasn’t convinced beyond a reasonable doubt that it was a marked departure from the behavior of a reasonable person. Thanks for the very thoughtful response, CGNMB. I guess what I was trying to emphasize is Garfinkel’s ruling that speeding is something “even the most careful driver may occasionally perform” appears to open the door to the issue of whether speed limits even matter. But I get that in terms of the law and assessing culpability for dangerous driving, this is one factor to consider. People that speed increase the risk to others. Does the speeder have the right to subject others to that greater risk? This really all about rights in the end.